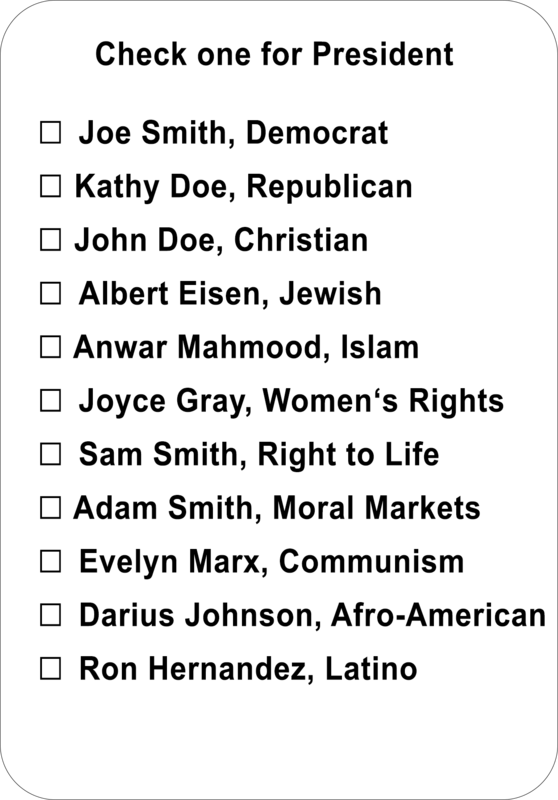 Party names on ballots transform a government of the people into a government by groups. Most of the time voters will vote for a group they identify with rather than an individual candidate. After the election, it is those groups that control the corridors of power and the government. The government becomes a plutocracy in which the primary financial funders of the political parties control the legislation. This is one reason the United States today is neither the Democracy democrats talk about, nor the Republican form of representative government the U.S. Founders sought to create. Do you think everyone would vote for a political party? No, voters would often vote for the particular group they identify with most strongly, and often pay little attention to the name of the candidates or their professional qualifications for the job. Some people would vote for a political party, some for a religion, some for a social issue, others for an economic theory. When other group names like those above are not on the ballot, Democrats and Republicans fight to get them under the umbrella of their own party. However, after elected, that representative will be responsive to the dictates of the party, that may have very little in common with the needs of the people in the district he/she represents or even the other groups with which they identify. Voting for groups is a non-democratic form of governance. It is tribalism. The United States has become a contentious divided society, not because of the individual representatives we voted for, but because of the government processes that have given two political parties more legislative power than the citizens and their elected representatives. The U.S. Founders envisioned a system of governance that enabled people to select their representatives, who would be accountable to those people who elected them. And, they sought to create checks and balances that would prevent moneyed interests or groups from embedding themselves in government and taking power away from the citizens. Political elites representing identity groups have circumvented those checks and balances and embedded themselves in government.They have done this by changing procedural rules of the Senate and the House, rules that put them on the ballot, creation of party caucuses in the government, passing new laws, and constitutional amendments. Increasingly representatives are pressured to vote lockstep with the party. In order to found the United States, the Fathers had to insure that no religion was able to force its beliefs on the entire population, nor use the government, with its power of taxation, as a method of raising money for one religion at the expense of people of other religions. Many of the original thirteen colonies that became states had their own religion. Massachusetts was Congregational, Virginia was Episcopal, Maryland was Catholic, Pennsylvania was Quaker, and New York was Dutch Reformed. None of these colonies would have joined a government that forced them to believe in and pay for someone else’s religion. The federal experiment was so successful, that all the states also gave up the idea of having official state churches. Pennsylvania disestablished religion in 1790 and New Hampshire was last to disestablish in 1877. Today most Americans see this wisdom of the separation of Church and State. However, they do not understand why the same principle of separation should apply to any identity group. We might see why neither the Hutu or the Tutsi tribal group should control the government of Rwanda, but political parties? The First Amendment specifically singled out groups labeled “religious” but not other groups. However, identity groups all share many of the same qualities of “religions” even if they are called ethnic groups, political parties, social clubs, or special interests. Looking backward from the 21st century, the quasi-religious feature of identity groups not organized as religious has become apparent. This was not the case in 17th century society where the church was the main, if not only, identity group officially embedded in society. While the First Amendment allowed freedom of association, which meant the formation of an infinite number of types of social groups including religions, it did not characterize these other free groups as “religious,” and therefore did not explicitly prevent laws respecting their “establishment”—in the sense of being officially endorsed by or embedded in the government). This was a major oversight. All groups have ultimate values and purposes. Laws imposing those values and purposes on others forms tryannies on par with the establishment of religion. The Communist Party of the Soviet Union was rightly called a quasi-religion by Westerners. The deification of Lenin, and the immortality given to him by a public display of his body, shares many of the same qualities as Christians’ deification of Jesus. Declaring Marxism-Leninism an official state orthodoxy is little different from having the dictates of Church of Rome declare orthodox beliefs that everyone in the Roman Empire in the Middle Ages was required to follow. There are many other parallels between both the beliefs and bvehaviors of “religions” and other groups. Anything called an “ism,” like “environmentalism,” is quasi-religious, as are ethnic, tribal, or issue-based groups. Not all groups believe in something they call “God,” but that does not mean they don’t have common goals and dreams they would only be too happy to impose on everyone else in society. The type of group one belongs to, for purposes of creating a good government, is less important than distinction between whether it is individuals or groups that control the processes of governance. In the first case then government is run by citizens, in the second case there will always be a form of structural oppression whereby goals of individuals get sacrificed for the goals of groups–and those who control them. When the same rules do not appy to all players and teams In a football league, we would say it is rigged. Suppose two teams payed the referees to call games in their favor, so they would always to win? We’d call it a “rigged” sport and no one else would have any genuine interest in watching the games or playing because it was not fair competition. Shouldn’t fair rules and competition in our government be more important than a football sport? Our saftey, health, and welfare depend on it. Why do two political parties have special advantages over other groups? Why are all citizens only given the option of voting for one of these groups at the polls? It is simple, the rules were changed in their favor while citizens were not vigilant. In prosperous times it seems easier to just vote for a group that says something you like and not bother with political but focus on your job and family. Politcal parties want voters, not “citizens.” A citizen is a person who takes responsibility for his society. A voter is more like a coin in a political party’s pocket. The United States, and democracies in general, are supposed to have governments run by citizens, not by kings, religions, tribes, political parties, or corporations. Being a citizen is being independent, being a voter is being a slave. It is time for Americans to realize they should behave as citizens not voters. It is time we create ballots suitable for individual citizens, not ballots for slaves of groups. Group-free ballots, like sugar-free diets, take a bit more effort but lead to long-term health. In this case, the health of a government and society. With group-free ballots—ballots without political parties listed after candidates–citizens will need to study the qualifications, skills, and all the groups alliancces and positions a candidate holds to make an intelligent choice. Today if you run a small business it is easy to vote a Republican slate, if you get paid by the government it is easy to vote a Democratic slate. But, as we have learned over the years, after the election, the political parties go to work for lobbyists, and most legislation only serve the interests of a few at the expense of most people who voted for either party. The system is rigged to accomplish this. If there were no candidate parties on ballots, an uninformed vote would become a random vote, and the random votes would cancel each other out. Those persons winning elections would be based on informed votes–the votes of citizens. The votes of “voters” unable to fall prey to groups whose names were removed from ballots, would become relatively meaningless. Groups would not be able the hijack the government from the citizens. In a democracy, or a republic, that is how it should be. Of course, removing party names from ballots will not undo the myriads of corrupt legislation and government rule of process that rig the system, but it would be a great start. Many other changes are already described in my book Life, Liberty, and the Pursuit of Happiness, Version 4.0.